In my years traveling and experiencing the world, I’ve met interesting people from many locations and different walks of life. Audrey Knight is one of those rare, precious jewels we might call the introspective artist. I met Audrey while working in computer animation and knew her as a gifted animator who worked with character lip-synching. But time often reveals the multi-dimensional layers of our coworkers-turned-friends and that is the gift of living in the art world, most certainly, isn’t it? Courageous poet for her past, and fanciful story-weaver for her child, Audrey reveals a bit of her secret energy and passion to those who seek it in her artwork and writings. It is a delight to have had the chance to chat with her about her projects and perspectives. KARA: Audrey, Thank you for chatting with me today! I have enjoyed many of your literary entries on your website. I especially like “panspermia”. It’s a sort of journey inward with interesting visuals. Do you remember how this piece revealed itself to you? AUDREY KNIGHT: This entry came to me while I was pressing the heels of my hands into my closed eyes and letting my mind go blank. KARA: Is writing entertaining for you or would you rather draw? AUDREY KNIGHT: My writings are uncensored thoughts streaming onto a page whereas my drawings are carefully planned and edited. In this way I feel like writing allows me to throw some ideas out immediately when I don’t have the time to draw, or when I wouldn’t even know where to begin. KARA: Tell me a little bit about the piece called “11.09” I’m also fond of the reflection in the pond motif, of how it seems it is our image yet we are trapped and if we go below there is another world, a subconscious. There are some amazing descriptions here; harsh, even gut wrenching. AUDREY KNIGHT: I wrote that describing my first husband’s suicide and the intense feelings of guilt I had afterward, and the fear I had of acknowledging whatever monsters lurked inside my own subconscious. KARA: Audrey. I am so sorry for your loss and the pain you went through. I see now even more the power of that piece. I cannot even begin to comprehend such a tragedy, yet within your brave writing, you faced it, unflinching. KARA: Hypothetically, if some magical being granted you the ability to teach one unforgettable lesson or pearl of wisdom to others through your artwork, writing or visual, what would you choose to bestow on humanity, knowing that it could not be erased? AUDREY KNIGHT: If there was ever one thing I was able to adequately preach to the world it would be that essentially, where it really matters, we are all the same, and we should genuinely care about each other. But seeing so many brilliant, talented, eloquent people have tried for thousands of years to teach this same message and the world is still filled with angry, divided people, I might reduce my message to simply “life is pretty freaking fantastic!” and hope that would at least inspire a few. AUDREY KNIGHT: Because life really is pretty freaking fantastic! We have so much potential and so much creativity, and for everything that has been done there is so much more which we could be doing. KARA: Now, I am really curious about your series of art pieces called “Mammalian Military”. Did this idea sudden come to you like a light bulb turning on or was it a combination of elements you have been working with for years? And please feel free to share, tell me more! 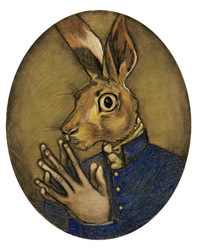 AUDREY KNIGHT: I was drawing thumbnails for a band’s poster when I drew the hare with the long hands. The hare never turned into the poster but I loved it and taped some paper to the wall and attacked it with charcoal and pastels. The ideas for the animals had been floating around in my head for over 10 years, and I have been telling my daughter stories about a place where there is a city built by elephants where all the stone is bright white and there are a million bridges over canals filled with brightly colored fish. AUDREY KNIGHT: When I saw the hare a light bulb did turn on when I realized he probably lived in a city further to the west of the elephants, and the rabbits, sheep and horses in that country would most likely be at war with the elephants and giraffes, who would be at war with the polar bears and walrus of the north, and so on. So I started to draw the rest of the animals of that world, and the stories and the drawings complimented and completed each other. My mother read us C.S. Lewis and Tolkien before I started kindergarten and I have spent my life reading science-fiction, fantasy, Shakespeare and nearly everything else constantly. I think reading is the greatest thing anyone can ever do. Unfortunately, my brain has become a mushy sponge dripping with images of robots, worm-holes, elves and distant desert planets. I have difficulty entertaining company by pulling specific Vonnegut quotes on cue from my grey skull-soup, but I know that everything I have read is in there influencing my art, even if only on a subconscious level. KARA: You have “southern pony”, “tzar walrus”, “strategist hare” among others. These are just a pure delight. How did you achieve that antiquated or historical look? Did you use references of people in similar poses? They really are delightful. AUDREY KNIGHT: The tones of the paper and the use of charcoal I believe really add to the antiquated look, and I vignetted the borders with additional charcoal. I spend a lot of time looking online, at the library and at antique stores, studying military uniforms, and I use photographic reference of clothing to lay out the folds and overall look but I try not to replicate it precisely since this is a fictional world. I also spend a great amount of time at the zoo drawing studies of the funny animals. KARA: I love how the hare has these long fingers, touching, reflective. He curls them like one might do while contemplating some elaborate plan but his eyes are wide open as if the door just opened and he might be interrogated! I can almost see his cottontail flitting behind him as he heads for safety. What were some of the stories behind these characters? What is your goal in their design? AUDREY KNIGHT: I really like that! That is exactly what I had in mind while drawing him. I want the animals to portray a juxtaposition of the things we humans feel place us above the other animals–our languages, religions, and “civilized” wars–set over the unbridled wild instincts to bite or flee, and to illustrate my thoughts that no matter what layers of modernity or civilization we place over our military, we are still just animals fighting over food and land. KARA: My favorite is “general giraffe”! His eyes are so dewy and the design of his fur is very nice. Are pastel and charcoal your favorite mediums? AUDREY KNIGHT: They are right now. I have always loved charcoal because it is so delicate and transient, and any type of crayon feels more stable in my hands, more like an extension of my fingers than a long paintbrush. I also love to be able to use my fingers and hands to push the powders around on the paper so it also almost feels like sculpting. KARA: I notice on some of this collection there is a nice contact or grain to the paper. Did this come from the paper itself or do you use a texture underneath the paper? AUDREY KNIGHT: This came from the paper itself. On some I started drawing on the smooth side of the paper without thinking first, and now I wish I hadn’t. KARA: Now this collection recently appeared at a place called “Frenchy’s”. Do you enjoy having exhibits or do you prefer to just display a little at a time or online? AUDREY KNIGHT: I am more comfortable with the anonymity of showing online, but I am exhibiting art more and more in the real world and gradually warming up to it. Plus art always looks better in person than on a computer screen. KARA: I notice that you also designed an amazing poster for the same business. A mermaid. The lines are absolutely wonderful and I was delighted to see that she has tattoos, like some salty pirate had a bit of time to spare at sea! This looks like watercolor. Was this done old school or digital? AUDREY KNIGHT: It was done with watercolor, pencils, and markers. I would always prefer a pencil over a mouse. I still scan everything into the computer to lay it out in photoshop and add text, but it is easier and quicker for me to paint something than to try to figure out how to do it on the computer. KARA: Which is your favorite poster or piece you designed for a business? Why? AUDREY KNIGHT: Eeek, I am never good at naming favorites. 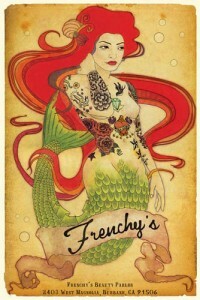 I love the “Chasing Alice” poster because I felt like it turned out better [than] I had hoped, and I love the “Frenchy’s” poster because I love drawing mermaids. KARA: What is your greatest challenge when you are creating a new piece? What gives you joy in the experience? KARA: When I saw your poster for “Chasing Alice” my breath caught in my throat. The color palette, the forest theme,–oh! and especially–the use of the bird for the eyelashes; it’s just simply amazing. Elegant. Do you choose to do many preliminary sketches when starting such a project or do you ‘dive in’ and ‘go with the flow’? AUDREY KNIGHT: I do loads of thumbnails beforehand and it is fun to see the evolution of a piece sometimes from something originally very different. 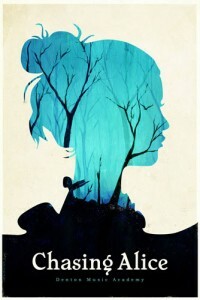 The “Chasing Alice” poster started off as an idea for an old Victorian silhouette in an elaborate frame, and then the frame disappeared and a forest appeared inside the silhouette. KARA: There is something very exciting with your landscape works, as well, like your oil of the screen and window and the piece called “feast”. Again something gripped me when I first looked at “the red bench”. The depth of the porch creates in the observer a pulling sensation. It’s really gutsy. Are you exploring oil right now? Where is the path taking you? AUDREY KNIGHT: I love working in oils and want to continue experimenting and exploring them but I had to put the turpentine and paints away when my daughter was born 2 years ago. One day when she is older I will bring them back out, but right now I am loving the non-toxic qualities of charcoal. KARA: How might a reader own one of your art pieces? Is your work available for purchase? AUDREY KNIGHT: There are prints available for purchase at all exhibitions, and I have plans to put an online store on my website. Also I take orders by email. KARA: What are you working on now? Anything you would like to add for my readers? What is the best way to follow you? and a website http://audreyknight.com/index.html which I update occasionally. KARA: Thanks Audrey! This has been really fun jumping in and finding out about your creative process as well as enjoying your work. 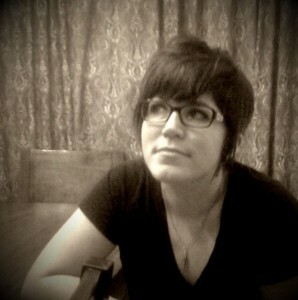 I’d like my readers to know that Audrey Knight is available to do freelance illustrations and artwork for book covers! Very exciting. Her mermaid poster is amazing. Imagine something so beautiful for your next paranormal?! Check out her fan page on FB and her website or contact me. Thank you for the very touching interview with Audrey Knight. I just stepped into the presence of two beautiful souls, and I feel awed. I can’t express my emotions right now; they are bubbling up with a fountain of tears and smiles. I know Audrey, and I am so pleased that such a gifted person as yourself could interview her. and give opportunity for others to recognize her giftedness. May you both never lose your childish wonder and your artistic expression of it to our sad and often skeptical humanity. Shirley, thank you for such a thoughtful comment. Audrey’s a talented gal and it was a joy to interview her! I look forward to seeing more of her wonderful artwork and words.